Hello! I’m Bari, a Jersey girl living in California. I would describe myself as a fitness enthusiast as I have always had an interest in fitness and health. 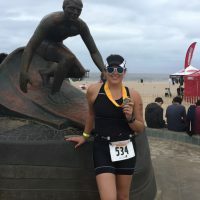 One of my greatest accomplishments was running the NYC marathon but since moving to California, and being so close to the beach, I began to dabble with the sport of triathlon. You can find me traveling all over Los Angeles to find the best, most fun, sweaty workouts (#willtravelforworkouts). I love trying new things, whether it be workouts, food/recipes or activities. When I’m not at the gym, attending a workout at a studio or cooking/baking, you can find me in a classroom, as I am a speech-language pathologist for an elementary school. I created HowHardITri, a lifestyle and fitness blog, because I have a passion for fitness, health and food. I love sharing my experiences and inspiring and helping others. You never know if you’ll like something unless you ‘Tri It Out’.